What does a preaching pastor do with his time after he retires from the pastorate? Our tiny but mighty MARKINC team has no problem answering this question! At the end of 2016, Chuck officially retired as the Senior Pastor of Glasgow Church – now called Reach Church. Within a few months, our MARKINC team had him video taping answers to tough questions like these. By the end of 2017, 9,766 people watched the Ask Dr. Betters videos. That’s impressive since we had no marketing budget for this project. But watch as God multiplied the impact. By using current stats, we project that by the end of 2018, 47,269 people will watch Ask Dr. Betters videos. Can I say that number again? Each of those numbers represents a person. Please tell Dr. Betters how much his videos have helped me. My husband, age 52, died in a farming accident on July 9th and I found this ministries' videos on uTube. They have helped me through the grieving process and give me hope of seeing my husband again. I did not get to tell him good bye and it has been very hard. My hope is in the Lord and my strength. Thanks for your ministry. It has been a comfort. Each person who accesses these videos has a family or a circle of influence. Our tiny team has a mighty dream of reaching thousands more with the message of help and hope that comes through in each of these podcasts. Did I mention that we are a bread and fishes ministry, that God miraculously multiplies every minute, every dollar, every dream and touches thousands with the Gospel through the platform of MARKINC? This all boggles my mind! Each video is offered free of charge. But, none of them are free. Our tiny team made up of Melissa Weisenfels (Executive Director), Kasie Lamme’ (Director of Operations), Stephen L’Italien and Luke Papilli (Videographers and Editor) and Chuck – the question answerer, work together to produce each video. Let me share a little bit with you about how it happens. Melissa oversees the recording session. She listens carefully to Chuck’s answers and makes notes of key words, scriptures and comments that Stephen will add to the video. After Chuck answers the question, he looks at Stephen, Luke and Melissa and asks for their input. Sometimes based on their response, he will record the answer a second time. Sometimes, Chuck reads the question to this tiny team and they talk through the topic before he answers, looking for input, perspective and reaction. As I mentioned, these questions are tough and answering them in only a few minutes is even more difficult. I have watched as this team tries to relate and understand the real pain behind the person who submitted the question. These recording sessions last several hours, sometimes longer. What most people don’t know is that Chuck recorded most of 2017 the summer and fall after his brain surgery that didn’t go well. He was in the 1% of people who experience severe complications which meant he had to learn to walk all over again. His brain still has to work hard to compensate for the damaged nerve that controls balance. He lives with vertigo 24/7. Since his brain has to work extra hard to compensate, he suffers from extreme tiredness during and after an active day. 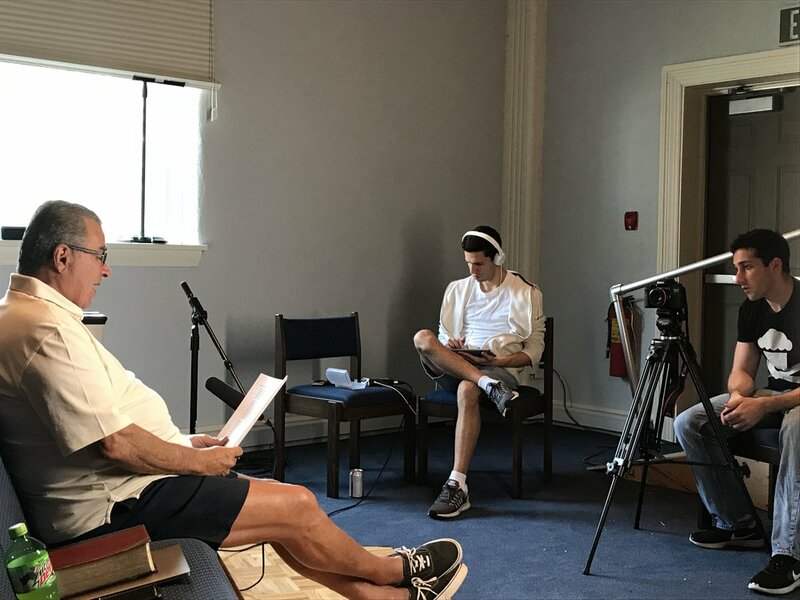 God gave him strength and continues to give him strength to get through the video sessions and I still give him permission to crash the next several days! After the recording session, Stephen edits the five to eight minute videos. At Melissa’s direction, he adds key words and scriptures. I have often said that MARKINC is a bread and fishes ministry. Our tiny team has mighty plans and God continues to multiply our work into an ever widening circle of eternal impact. This year, 2018, iDisciple added Ask Dr. Betters and our Help & Hope resources to their platform that has a world wide audience. This is at no cost to us. We are watching God grow eternal fruit from the labors of our tiny team and small budget that is beyond anything we could have imagined. One of our passionate supporters is graciously giving a $10,000 matching gift to encourage everyone who has been touched by the message of help and hope that MARKINC offers, to give so that this message will continue to be heard by thousands. These are exciting days for MARKINC. Next year we will celebrate our 25th anniversary! Though we are tiny our God is mighty and He is opening wide the doors of opportunity for us to touch thousands with His message of help and hope. Please pray about how you can partner with us if God has used MARKINC to encourage you in your own life. Pass on that help and hope through your financial support. Every dollar you give between now and August 15 will be doubled. Please, no gift is too small. Give today.